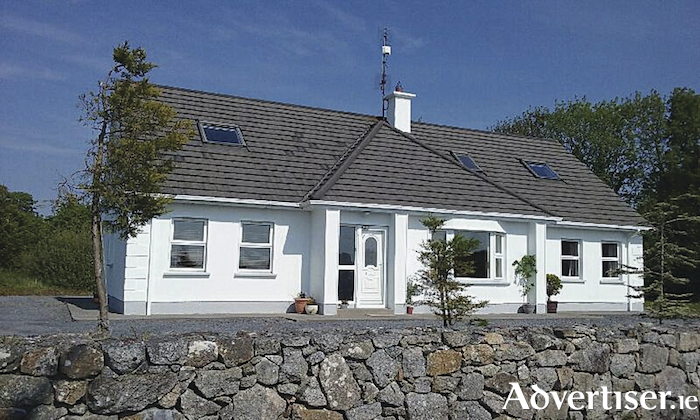 Sherry FitzGerald brings to the market a quality detached family home at Poilini, Furbo, for sale by private treaty. The property is situated on a mature half acre site with well defined boundaries. Built in 2000, this large family home was designed with care, attention to detail, and with a view to making it an easy to maintain comfortable home. This home is bright and spacious with well proportioned rooms, from the large entrance hall with solid timber floors, to the bright and airy reception rooms with solid doors, skirtings, and architraves throughout. The ground floor accommodation includes three reception rooms to include kitchen/dining room, living room, and study/playroom, a utility, three double bedrooms, one of which is en suite, and a main bathroom. On the first floor there are two large double bedrooms, a shower room, and a large walk-in hot press. The BER is C1. Asking price is €350,000. This home is ready for immediate occupation, and must be viewed to be truly appreciated.